Spring! Let’s Celebrate with a Sale! I know it’s not “officially” spring yet, but my daffodils – which have popped up abundantly all over – are telling a different story! And so, to celebrate – and to welcome a whole bunch of newcomers who have joined our Needle ‘n Thread community over the past several months – I thought today would be a great day to offer a sale on my favorite e-books, both of which offer springy projects, techniques, and colors that sing Spring! The first e-book on sale through this weekend is Lavender Honey & Other Little Things, an instructional guide to embroidering and finishing a whole slew of delightful needlebooks, pin keeps, ornaments, and fobs. You can read a thorough description of the contents of Lavender Honey right here. And yes, there is an adorable wee bunny in there, perfect for Easter. And the second e-book on sale through this weekend is Stitch Sampler Alphabet. This is a whopping instructional guide for embroidering gorgeous floral decorative initials using over 65 stitches and stitch combinations. The stitches in this e-book are terrific for employing in all kinds of surface embroidery projects, not just decorative initials. You’ll learn some really fun stitches that can work anywhere! And the initials – this time of year, I think they’d look glorious on things like monogrammed fabric baskets, which would be perfect for Easter (and beyond!). 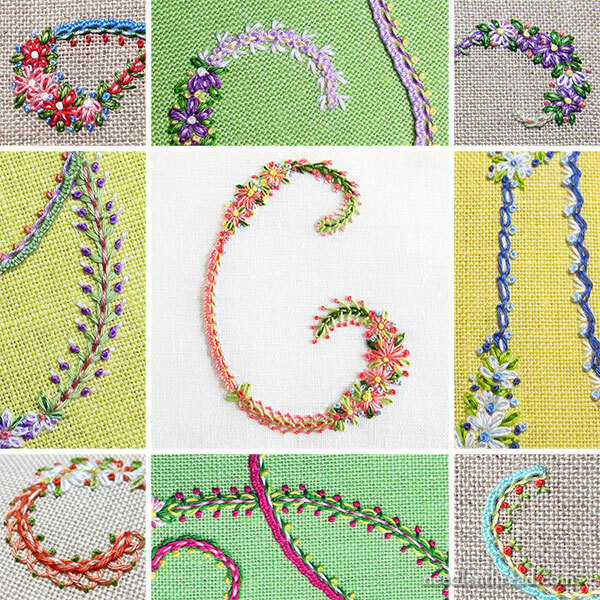 You can read a thorough description of what’s in Stitch Sampler Alphabet right here. Both e-books are on sale for 15% off, today through next Saturday, March 10 – 19. You can find both e-books in my shop here on Needle ‘n Thread. Once your payment in processed, you’ll receive a download link in your email. Download the PDF e-book directly to your computer as soon as possible, and from your computer, you can then move it to any other device you want to use it on (like a tablet, iPad, etc. ), or you can print it. It’s that simple! 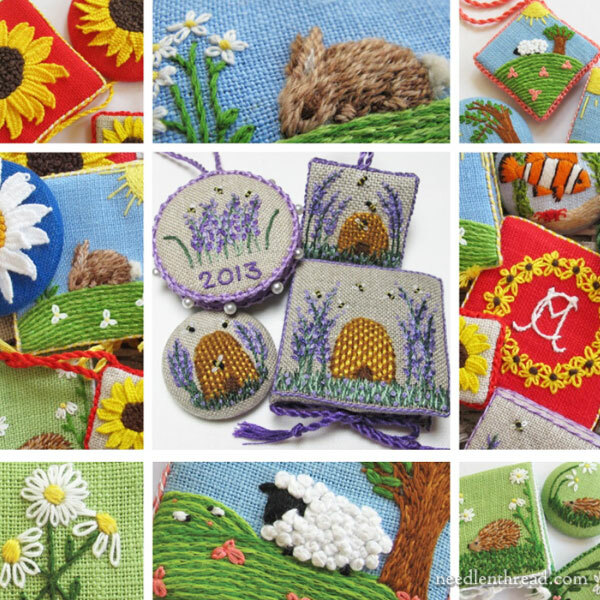 I hope you enjoy the e-books and that you stitch up some glorious things for Spring! Coming up tomorrow, a Really Big and Wonderful Crewel Surprise. See you then! What a lovely Spring idea, thanks for the sale, although I have all your e-books and they are great. The little things were really fun to do and look lovely on all the different project items that you show in the book and the Stitch Sampler Alphabet is also full of lovely embroidery stitches and different colour threads great. Thanks for offering the sale and I look forward to the crewel surprise. I have been thinking about Lavender Honey & Other Little Things. I’m somewhat more into historical and regal style embroidery, not so much colorful and cute. However, those itsy-bitsy sheep are just soooo cute… 🙂 I’m also especially interested in learning to finish things, so I guess this would be a good buy. I have a question for other European readers… What would be the best linen available in Europe for surface embroidery? I would be happy to hear your recommendations! Yes, I know the feeling though I try to keep my spirits high… They do make quality linen in Europe – aren’t Belgian and Irish linen just that? – but where could one actually find them? There are web shops who sell “quality linen for surface embroidery”… it is all very vague and I’m hesitating as it could be just same “quality” as in the local shops. Also, I’m not a seasoned sticher and don’t have first-hand experience of different linens and other fabrics. I’m in so much need of recommendations! I’ve got both of these and they are terrific. Mary does a wonderful job of describing how to do the stitching and put things together, accompanied by color illustrations. Well worth it! I just want to write and let everyone know that you will absolutely enjoy this phenomenal e-book. (The Letters one). I purchased and downloaded the e-book a few days ago and I must say I am very impressed with not only the letters and stitches, but the whole interactive way this book is put together. I read the e-book the day I downloaded it, and read everything in an evening. Well, no, that’s not true. I did not read every instruction on the individual letters, but I did read through 3 or 4 letters, but I also read everything else in the book! I am now doing all of the stitches to make sure I understand them before actually doing a initials. *** I love the photo tutorials. I have watched all of the videos over the past couple of months, but the photo tutorials pick up where the videos left off. You will NOT be disappointed and I hope everyone takes my advice and buys the book! Plus, with everything that Mary does for us via this website/blog, all the instructions, both video and photo tutorials, not to mention the advice she gives, I think we owe it to her to purchase her e-books to help support her. I am going to, in the next couple of months, purchase all of the e-books, have them printed in color and put them in a binder so I have a hard copy to have when I am traveling or waiting at the doctor’s office. Thank you Mary for putting together this book. It’s wonderful, absolutely wonderful! P.S. I also purchased Trish Burr’s beginning needle painting book! Arrives on or before Monday! I wouldn’t know about needle painting had it not been for you! Thanks,Christi! I’m so glad you’re enjoying the ebook! Have you ever tried Japanese embroidery? Here is a nice little video about it. Wondering if anyone has finished some of your lavender honey designs into little sachets filled with dried lavender flowers? These wild be adorable and perfect spring gifts for bridal showers etc!